Directed by John G. Avildsen (the Oscar-winning filmmaker behind Rocky), The Karate Kid is one of the best sports movies ever made. Starring Ralph Macchio and Pat Morita, this feel-good flick focuses on a bullied high school kid who learns martial arts from an elderly Japanese master, and the result is pure 1980s magic. 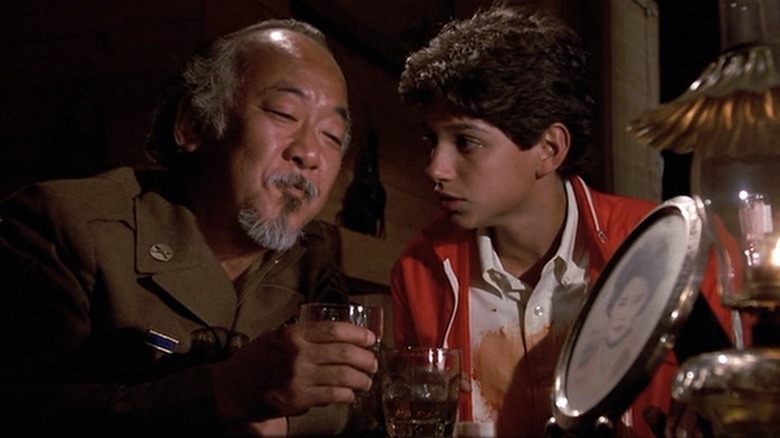 Over 30 years later, people are still watching—and quoting—this movie, so perhaps it's time to put down those chopsticks and leave that fly alone as we look behind-the-scenes and find out why The Karate Kid is the best around. The saga of Daniel LaRusso and Mr. Miyagi all started when producer Jerry Weintraub (Nashville, Ocean's Eleven) was watching television one day. According to Jared Cowan of LA Weekly, Weintraub saw a news story about a local kid who earned a black belt in karate to protect himself from a group of bullies. 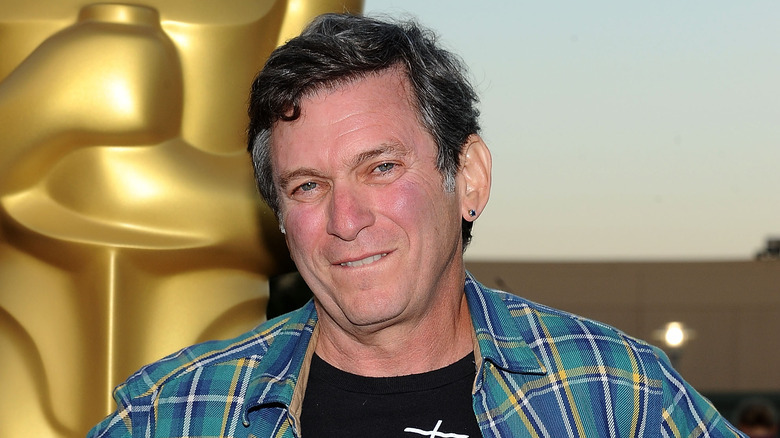 Weintraub was immediately inspired, and soon enough, Columbia Pictures hired Robert Mark Kamen (pictured above) to write a screenplay. Now, if you've never heard Kamen's name, you've certainly seen his movies. The man has written films like Taps, Lethal Weapon 3, The Fifth Element, The Transporter, and Taken. And when he was approached with the idea of a martial arts movie, Kamen was able to draw on his personal experience while writing the script. After all, he'd been studying karate for 17 years. 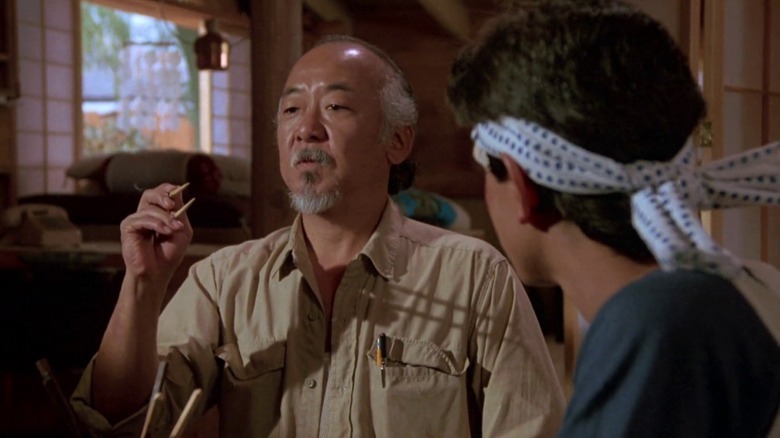 He based the character of Mr. Miyagi on one of his instructors, a guy from Okinawa named Meitoku Yagi. And the character of John Kreese—the evil "sweep the leg" sensei—was a combination of two people Kamen had known in real life: a tough Marine-turned-karate teacher and a martial arts instructor who ordered his pupils to injure their opponents. Kamen was also the man who came up with the film's title…sort of. Originally, the studio was just calling it "The Karate Kid Project." In a stroke of genius, the screenwriter decided to just get rid of the last word, and voila, that's how you name a classic movie. 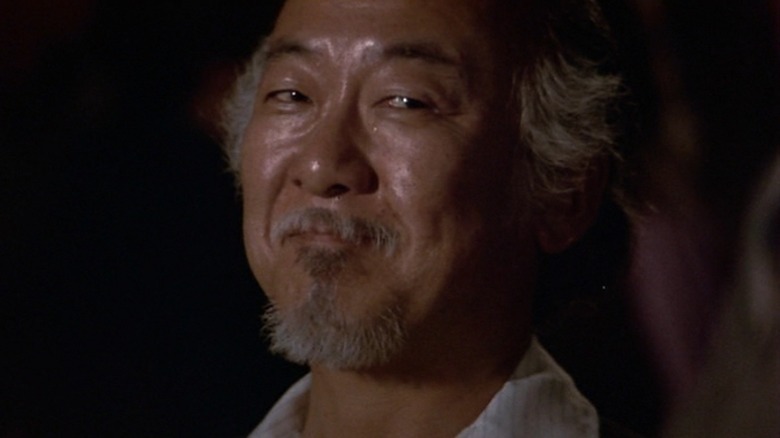 Other than maybe Yoda or Obi-Wan Kenobi, Mr. Miyagi is probably the greatest movie mentor of all-time. 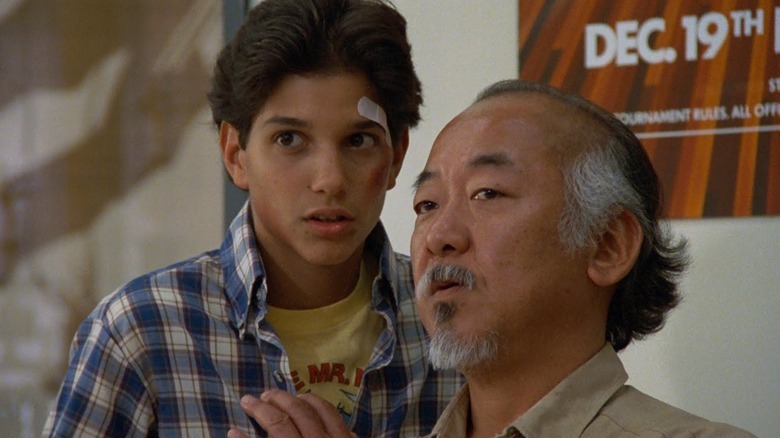 Of course, if the filmmakers had cast anyone else in the part besides Pat Morita, it's possible moviegoers would've forgotten about The Karate Kid long ago. Morita is perfect in the role, and his performance earned him an Oscar nod for Best Supporting Actor. However, back in the day, Morita wasn't such an obvious choice for the part of a martial arts master. He used to be a comedian, and before The Karate Kid, Morita was best known for playing the comical character of Arnold on Happy Days. So when director John G. Avildsen approached producer Jerry Weintraub with the idea of casting Morita as Miyagi, Weintraube wouldn't even consider it. He didn't want a funnyman. Instead, he wanted to go with Toshiro Mifune, the Japanese star known for movies like Yojimbo, Rashomon, and Seven Samurai. But Avildsen was convinced Morita was the right man for the job, so he came up with a clever way to trick Weintraub into watching the actor's audition. Avildsen did a script reading with Morita and recorded the whole thing. Then during a run-of-the-mill meeting with Weintraub, Avildsen pulled a fast one, putting on the tape and surprising Weintraub with the audition. However, instead of getting angry, the producer was kind of impressed, although he required Morita to audition five more times before giving him the gig. But after passing his fifth and final test, Weintraub admitted that he'd almost made "the worst mistake of [his] life" by brushing him off. Realizing the error of his ways, the producer gave Morita the role, and the rest, as they say, is Hollywood history. Believe it or not, Ralph Macchio was 22 when he played the part of teenaged Daniel LaRusso, but despite the age gap, Macchio made for a perfect protagonist. Coming off Francis Ford Coppola's The Outsiders, Macchio had some steam heading into The Karate Kid, but when it came to landing the role, his snarky attitude is what really helped him get the gig. After screenwriter Robert Mark Kamen met Macchio to see if he was right for the role, he came away describing the young actor as "obnoxious," and really, that's exactly what Kamen and John G. Avildsen wanted. They were looking for somebody with an attitude, a guy who wouldn't take crap from anyone, just like Daniel. In fact, they liked Macchio so much that they kind of rewrote the part for him. Originally, his character was called "Daniel Webber," but since Macchio was Italian, they changed his last name to "LaRusso." As for William Zabka—the actor who played bond bully Johnny Lawrence—he probably got the job thanks to some extreme method acting. When he was first trying out for the part, Zabka got so into character that he actually grabbed Avildsen by the shirt, which probably isn't a smart idea when you're trying to impress the director. But in this case, it seems like Zabka's bad guy persona paid off because he was called back several times. However, during one of these auditions, Zabka got a little too zealous showing off his martial arts skills and actually kicked a hole in the wall. Still, all's well that ends well, and Zabka was cast as the captain of the Cobra Kai, creating one of the most memorable villains to come out of the 1980s. While Johnny Lawrence is the bad guy we all love to hate, John Kreese is the real villain of The Karate Kid. Played by Martin Kove, Kreese is a Vietnam vet who believes in striking first, striking hard, and showing no mercy. He's the kind of guy who assaults his own students, and he comes off as the quintessential martial arts monster thanks to a menacing performance from Martin Kove. However, many Karate Kid fans have wondered what it the movie would've been like if the Cobra Kai sensei had been played by Chuck Norris. After all, Norris was offered the part but turned it down…right? Well, according to Brian Cronin of CBR.com, the Chuck Norris connection is nothing more than a myth. As it turns out, Norris was never offered the role, although if someone had asked him to play Kreese, Norris says he would've passed on the part. Why? Because he thought the character cast a bad light on karate. 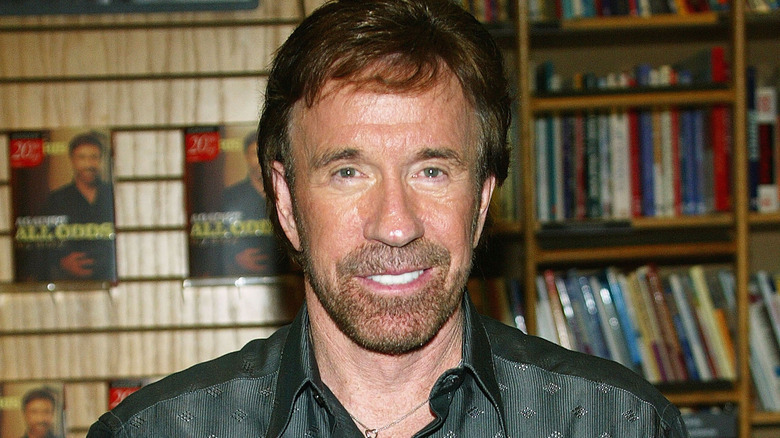 Sure, that might sound a little silly, but it's important to remember that, despite a decade or so of ridiculous Chuck Norris joke, the man is a legitimate martial artist. Back in the '70s, he ran multiple dojos, and he was the undefeated world professional middleweight karate champion for six years. So it makes sense that he wouldn't want to play a character that might hurt the sport. Of course, we're just dealing with hypotheticals as he was never offered the part. Still, while it's fun to imagine Walker, Texas Ranger in the role, we can all agree that Martin Kove was the best choice, as Norris can throw a kick but isn't so great at reciting dialogue. When Ralph Macchio and company signed up for The Karate Kid, none of them knew much about martial arts. Sure, William Zabka was a wrestler in high school, but shooting for takedowns isn't the same as throwing roundhouse kicks. So to get them ready for a karate tournament, the filmmakers called in Pat E. Johnson. This guy had studied tang soo do while serving in Korea, and when he returned to America, he joined up with Chuck Norris, working at one of Norris' schools. Soon, Johnson racked up an impressive fight record, and not only would he go on to work with stars like Brandon Lee and Jackie Chan, he also had a part in Bruce Lee's Enter the Dragon. In other words, Johnson's combat skills were as legit as they come, and when he was hired as Karate Kid's fight choreographer, he got pretty creative when it came to instructing the actors. For example, he taught Macchio and Morita together so, as he put it, "they would share their aches and pains like two little old men, and they built camaraderie through the training." He also made sure to train them in a very relaxed atmosphere, similar to Mr. Miyagi's style. However, Johnson took a very different approach with the Cobra Kai. He basically put them through boot camp, forcing them to do push-ups and treating them like soldiers. 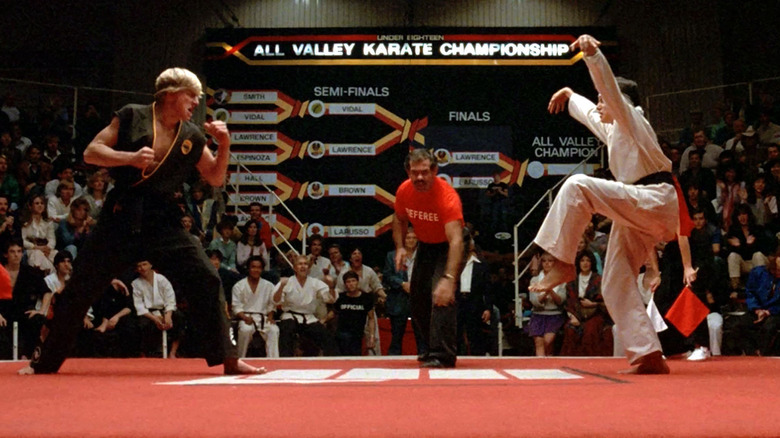 As for the actor who played Kreese, Johnson explained on a DVD special feature called "Beyond the Form" that he wanted William Zabka and the rest of the kids to view Martin Kove as an experienced black belt. To create this illusion, Johnson trained Kove privately, keeping him away from the rest of the bad guys. That way, when Kove met the rest of the crew, they would view him as a real martial artist and treat him more like an actual sensei. Johnson's methods were pretty clever, but his work on The Karate Kid wasn't all just behind-the-scenes. 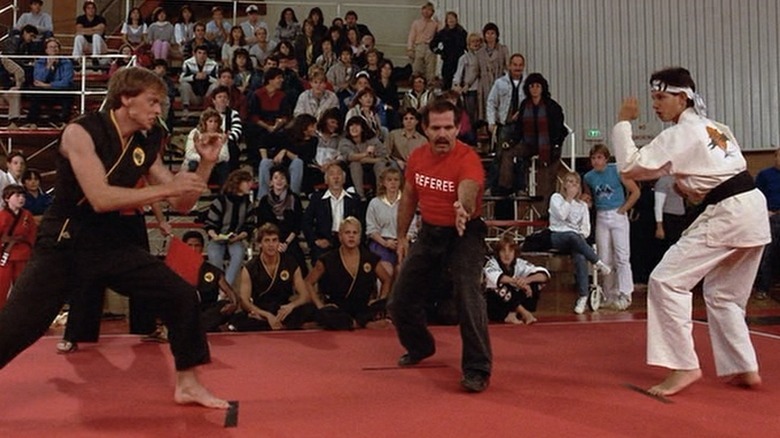 The next time you watch the film, pay attention during the karate tournament, and you'll see the fight choreographer playing the part of a mustachioed referee. While Pat Morita threw quite a few punches in The Karate Kid, he wasn't able to pull off every move required by the script. So when it came time for Mr. Miyagi to do something crazy—like jump over a chain-link fence to give karate lessons to some bullies dressed as skeletons—Morita would step aside for a real-life martial artist named Fumio Demura. Born in the Land of the Rising Sun, Demura specialized in karate and kobudo (a style involving weapons), and after winning the title of All-Japan karate champ, he packed a suitcase and sailed for America. However, Demura only had $300 to his name, and when he first arrived in the US, he was so broke that he had to sleep in a garage. But fortune favors the bold, and soon Demura was opening his own schools and giving karate demonstrations at places like Knott's Berry Farm and the now-closed Japanese Village and Deer Park. Suddenly a star, Demura was a regular on the cover of Black Belt Magazine, and he performed in places like Las Vegas and Paris. Crazier still, he even helped Bruce Lee learn how to use nunchaku (aka nunchucks). Eventually, Demura befriended Chuck Norris, and it's said the American recommended him for the part of Mr. Miyagi. But according to Demura, he turned down the opportunity because his English wasn't good enough, although he did accept the job as Pat Morita's stuntman, doubling for the actor in the first three films of the franchise. But while Demura is the most famous stunt double in the film, we've got to give a shout-out to Darryl Vidal. Not only did Vidal play one of the semi-finalists in the movie's climactic karate tournament, but he's also the guy who doubled for Morita in the beach scene where Miyagi throws his graceful crane kick. Basically, Vidal is the man who helped set up the movie's most famous scene, so we've got to give some credit where credit is due. The 1980s was a great decade for motivational theme songs, but few were quite as inspiring as "You're the Best" by Joe Esposito. This blood-pumping anthem plays during the montage sequence of The Karate Kid's tournament scene as Daniel LaRusso hits and kicks his way toward the big showdown with Johnny Lawrence. The song is amazingly epic and over-the-top, but shockingly, in some alternate universe, there's a version of The Karate Kid that doesn't feature the line, "Never doubt that you're the one, and you can have your dreams!" So basically, Rocky's loss is our gain, and the song is one of the big reasons that we still love Esposito today. And being part of such an iconic film is incredibly rewarding for Esposito as well. As the singer once explained to Popdose, "I'm thrilled to have been a part of it—it gives me a little something back for all the years I put in. Don't forget, I'm in Vegas, singing in lounges, and sometimes it's a little discouraging. But when someone remembers what I've done from a movie…it makes me feel pretty good." When most people think of The Karate Kid, they remember Daniel's bizarre training regimen or his final confrontation with Jonny. But in between all the fighting, there are a couple of little scenes that—while a little more quiet, a little more calm—pack an emotional punch. For example, there's a moment where Daniel finds a drunken Mr. Miyagi wearing a soldier's uniform while singing a mournful song. Daniel soon learns that his mentor fought for American during World War II, but despite his patriotism, his pregnant wife was tossed into an internment camp where she died to complications during birth. It's a poignant moment, and one that was largely inspired by Pat Morita's own life. Growing up, Morita spent most of his childhood in a sanitarium. As a boy, he suffered from spinal tuberculosis, and as a result, he was forced to wear a full body cast for years. Thankfully, he recovered from the disease by age 11, but as soon as he was discharged, little Pat Morita was escorted by an armed FBI agent to an internment camp for Japanese-Americans. Sure, he'd been reunited with his parents, but now he was stuck behind barbed wire, and he remained there for nearly two years, a prisoner who'd committed no crime. So when it came time to film this particular scene, Morita was instrumental in developing Miyagi's back story. In fact, according to writer Charles C. Goodin, the song Miyagi is singing is an actual tune he heard while imprisoned. Thanks to Morita, the scene is incredibly powerful, but nevertheless, the studio initially wanted to cut it out. Fortunately, Morita and John G. Avildsen stood their ground, and the director believes it was this scene that earned Morita his Oscar nod. It seems every time a movie rakes in the big bucks, it doesn't take long before someone drags the filmmakers into court. Unfortunately, The Karate Kid is no exception. The trouble all started when a karate instructor named Bill DeClemente filed a lawsuit, claiming the movie ripped off his nickname. DeClemente's moniker was indeed "The Karate Kid," a name he heard sometime during the '60s, and he printed that title on business cards, signed it on certificates of promotion for whenever his students earned a new belt, and most importantly, he named his school "The Karate Kid Dojo." So when the movie came out, DeClemente assumed screenwriter Robert Mark Kamen had stolen his identity. However, a New York court just didn't see it that way. According to the verdict, only a few people knew about his nickname, so he couldn't blame the filmmakers for such a coincidence. Sadly for Bill DeClemente, his case was crane-kicked right out of court. When The Karate Kid kicked its way into theaters on June 22, 1984, the Ralph Macchio movie was an immediate smash. It grossed a little over $90 million domestically, making it the fifth highest-grossing film of the year, and it was also widely praised by critics. However, Karate Kid was hardly the only awesome movie to come out that summer. In fact, if you look at all the movies released that year from May to August, you might start to believe that 1984 was one of the best years for movies in Hollywood history. In addition to The Karate Kid, June 1984 saw the debut of movies like Gremlins, Ghostbusters, and Once Upon a Time in America. Jump forward into July, and moviegoers were treated to films like The Neverending Story, Purple Rain, and Revenge of the Nerds. Jump back into May, and theaters were playing movies such as Sixteen Candles, The Natural, and Indiana Jones and the Temple of Doom. The summer of 1984 also gave us memorable flicks like Red Dawn, Star Trek III: The Search for Spock, and The Last Starfighter, not to mention Streets of Fire and The Adventures of Buckaroo Banzai Across the 8th Dimension. And then if you pull back even further and look at the entire year, well, that's where it gets really crazy. 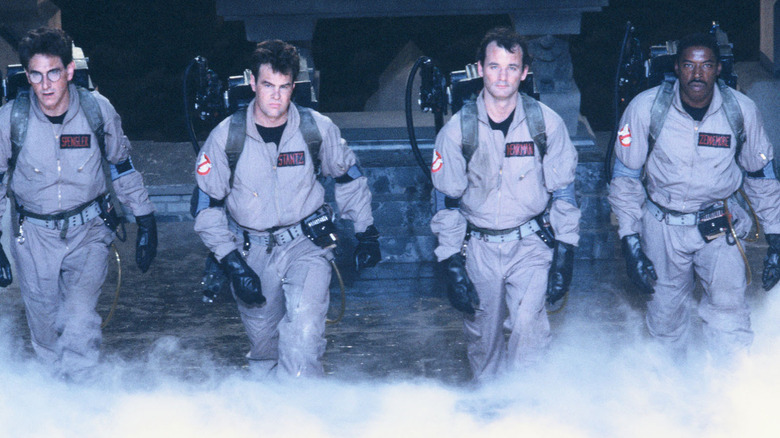 There was Nightmare on Elm Street, The Terminator, Beverly Hills Cop, Amadeus, This Is Spinal Tap, and Repo Man. If that's not enough for you, well, the Coen brothers also made their cinematic debut that year with their Texas thriller Blood Simple. In other words, when debating the best years for movies, 1984 is right up there with more iconic dates like 1939, and that's largely thanks to a scrappy little film about scrawny kid who learns how to sand floors and paint fences.